Got drums, keyboards, PA, or DJ racks to move? Do your fellow band members vanish into the night at load-out time? Here's help on wheels! 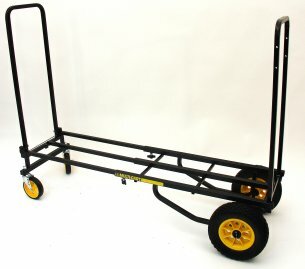 The Rock N Roller R10 cart is tough enough to handle 500 pounds of gear. Yet it only weighs 31 pounds to make it easy to manage! 20% larger storage footprint than the R8 Cart. The Rock N Roller R10 cart changes shape to meet your gear-hauling needs! Its 8-in-1 flexibility allows you to use the R10 as a conventional 2-wheel hand truck or a 4-wheel carriage, all with a few quick adjustments. And here's the best part: the R10 changes from 2-wheel to 4-wheel mode in about two seconds! 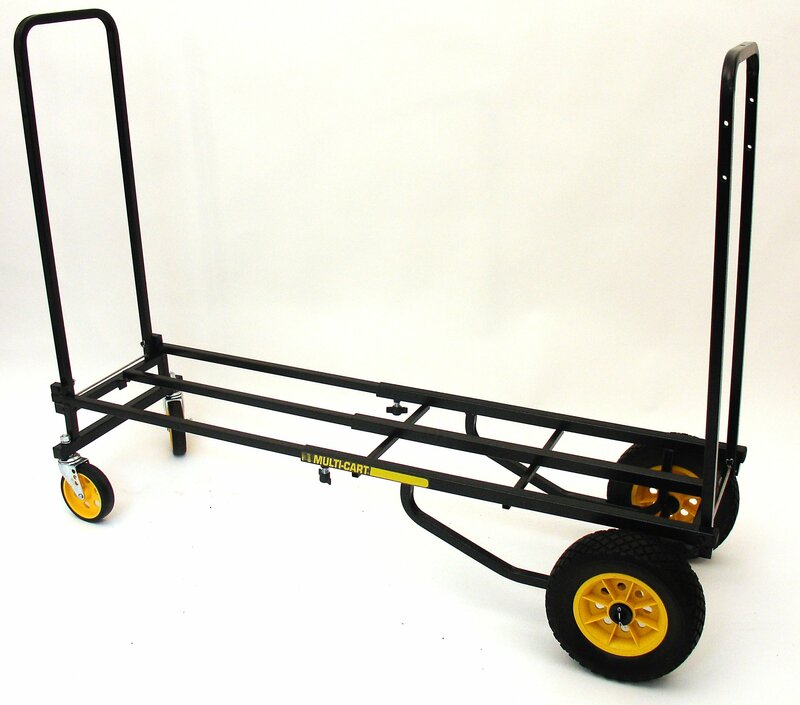 This cart will quickly become as cherished as your favorite roadie. The R10 features some Rock N Roll exclusive designs. The frame telescopes easily from 34" to 52" in length. The R10's non-skid frame bed surface resists load slippage. In addition, the folding sides rotate and lock into position by simply pressing release cables. In 2-wheel mode the R10 hand truck's long nose ergonomically pulls bulky loads toward you to make lifting easier. The Rock N Roller R10 uses Flat Free swivel casters that are very lightweight, strong, and have a special dampener to resist wheel wobble. The R10's Flat Free wheels absorb shock to delicate equipment and smoothly roll over rough surfaces such as dirt, grass, and concrete. Specially designed polymer hubs with roller bearings are up to 40% lighter than steel hub wheels. Take a Rock N Roller R10 Cart to your next gig and save your back! Converts Multi Cart in seconds into long (51.25”x18”) or short (29”x18”) shelf cart. 2-piece carpet-covered plywood deck attaches/detaches instantly to prevent small items from falling through frame. The cart I ordered is very sturdy and very well made. thank you! this thing is awsome. I love it. This cart is great. I have borrowed one, and then had to own one. It folds easily and will fit into a small space, yet it is large enough to haul inventory in one trip. I purchase 2 ea. R10 Max carts to trasport sound equipment and intelligent lighting. The R10 Max carts are E X C E L L E N T! Smooth wheeling, the carts break down / fold up very easliy. I will buy more units in the future. would like it to be about 2 inches longer. Pan cases bow the ends and are difficult to extract 2 pan cases pack flat side to flat side without smashing fingers. Rolls beautifully, even through snow. VAST improvement over luggage carrier! J Cillie - Washington D.C.
Well worth the cost. The folks that designed this cart engineered did a phenomenal job. Kudos! I like the cart over all. It is very handy as I transport many boxes at one time. For all the drummers out there the R10 is a fantastic multi cart! I use the cart to move around a 4 piece jazz drum set and hardware. I used to take 4 or 5 trips to get my equipment into a gig but now I can get all my gear loaded onto the cart and into the club in one trip. Hope this helps all the drummers out there! The multi cart has worked out great, the company may be ordering more to distribute to all are area reps. This cart is phenominal! I wish I'd bought this one first. It would have saved me a good deal of money. I transport model railroading engines and rolling stock from home to a museum to run for children and adults alike to enjoy. Some of these engines can cost over a thousand dollars and are very fragile. This cart with its flat free tires is EXACTLY what I need for this. I had another cart that had air filled tires that went flat while transporting my trains and I am lucky they didn't get dumped. The R10 Is so very perfect for me with its small storage size, large expanding length, and of course the flat free tires. Thank you also for making replacement tires and casters available just in case. Can't imagine a better transport tool. So far so good, very useful! We love this cart! In fact, we just purchased our second one because we've had such a positive experience with it. I am the CEO/President of Blessed247.com and I LOVE the Rock N Roller R10 Max! I am recommending it to all the other business owners I know. This cart was the perfect solution to my needs. I use the cart to transfer videography equipment in and out of all types of buildings with varying terrain. This cart makes the job very easy and quick. We used this to move a refrigerator and equipments. One of the best use was to move our daughter into her college dorm took just one trip versus the usual 5! Well worth it. Makes moving a one/two person job smooth and easy on the back. The absolute best friend for any musician, including drummers and percussionists. GET ONE NOW!